@WinJStar and @trauma I read some posts in a blog...can you believe peeps are actually talking about this flick? I suppose the posts could be from the handful of critics who gave the film a much better rating than I. It was suggested the animal no one wants to be is the rabbit. The rationale is there are plenty of them in the forest and it is the only animal the Loners are eating. I guess it makes sense if you have a warped mind like the author of this dreadful movie. Shout out to @LadyWrestler in Maine for your support for the Anyone But Hillary campaign. Finally saw The Nice Guys. Way better than I thought it would be. I hope they make a sequel. I felt Russell Crowe and Ryan Gosling had great chemistry. And, whoa, Kim Basinger had face work or something. She looks like her old self. Jen already reviewed it and I enjoyed seeing some of the drone flying procedures and technology. It is further proof of how politics and PC are far too embedded in how civilized societies conduct warfare...nowhere near as effective as when the Dogs of War were released upon USA's enemies. 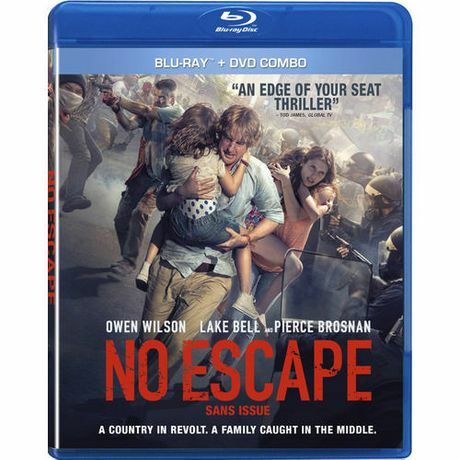 "In their new overseas home, an American family soon finds themselves caught in the middle of a coup, and they frantically look for a safe escape from an environment where foreigners are being immediately executed." Owen Wilson like I've never seen him act before. For you Jen @WinJStar...I finished season 1 of Mr. Robot and so far watched the first two episodes of season 2 and I am so glad I watched season 1 first. BTW I see the show is up for six Emmys and it will have a season 3. I've been really wanting to see No Escape. Thanks for the reminder. Ooooh, I found on cable the new Vacation remake. It was so hilariously awful. Can't touch the first one, but still good for some horrible laughs. I saw about three minutes of it recently...a better movie would have been Chevy Chase and Beverly D'Angelo as Seasoned Citizens in a Smart Car retracing their steps to Wally World. Watched No Escape tonight. Owen Wilson is just so great in everything he does. It was pretty violent, but it kept me on the edge of my seat the whole time. I enjoyed seeing Pierce Brosnan work again too! "A Pulitzer-winning writer (Russell Crowe) grapples with being a widower and father after a mental breakdown, while, 27 years later, his grown daughter (Amanda Seyfried) struggles to forge connections of her own." Fine acting by both Russell and Amanda. Well worth your time although it jumps back and forth in time and is a bit hard to follow early on in the film. Outstanding performances and cast. Such an odd film. Its beautiful to look at. My mom thought it was slow. I had to stay and see where it was going. I'm still not sure. This review is probably not helpful. It definitely makes you think.